Many recruits have a preconceived notion of Drill Instructors and boot camp before they even step on the yellow footprints, courtesy of former Marine R. Lee Ermey's role as Gunnery Sgt. Hartman in Stanley Kubrick's Vietnam era film, "Full Metal Jacket." For the few Marines who've never seen the film, Hartman is a tough as nails DI who instills and beats, a love of Corps into his recruits. "I'm not going to lie," said Lance Cpl. Victor Mendoza, currently deployed to the Middle East in support of Operation Iraqi Freedom, "when I first showed up to boot camp I was scared to death. I kept waiting for one of my DI's to beat the crap out of me." Mendoza's beating never came, but a love of Corps and deep respect for his Drill Instructors did. "At first you're so caught up in your own little world that you don't realize until much later the amazing job these individuals do," said Mendoza. "Without Drill Instructors we wouldn't have a Corps. They make Marines." Drill Instructor Duty is considered one of the most honored and valuable positions a Marine can hold and is absolutely vital to the process of making Marines, according to Master Sgt. Andre Robinson, a Marine Corps career planner. "If a Marine comes to me and expresses an interest in becoming a Drill Instructor, one of the first things I inquire about is their physical fitness," said Robinson. "They've got to be in great physical shape and have got to be squared away, but equally important they must live and breathe our Corps values of honor, courage, and commitment." Marines ages 22 to 37 with the rank of sergeant through gunnery sergeant can request Drill Instructor Duty. Corporals may be considered if they will be promoted prior to graduation from Drill Instructor School. Additionally, Marines must have scored a 90 or higher on the general and technical portion of the Armed Forces Vocational Battery test, must have no adverse Page 11 entries within two years, no alcohol-related incidents within three years, no courts-martial within five years, no non-judicial punishments within two years, and must not have filed for bankruptcy within two years or have divorce or separation proceedings still pending prior to reporting for duty. 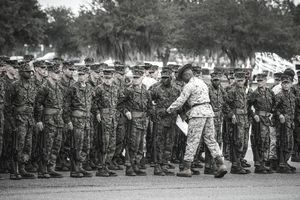 After passing the screening process and being selected for the 36-month Drill Instructor Duty tour, a Marine must first attend Drill Instructor School at Marine Corps Recruit Depot, San Diego, or MCRD Parris Island, S.C. The 12-week course emphasizes leadership, judgment, professionalism, time-management, and, of course, physical fitness. "It takes a lot of stamina and character to be a Drill Instructor," said Gunnery Sgt. Rose Cole, who served as a Drill Instructor from 1996 to 1999. "You have to be able to stay focused on the training no matter what. The worst part was the long hours and lack of sleep. Drill Instructors are up before the recruits and don't hit the rack until long after they are asleep, usually getting about three hours of rest a night for three months." Still, despite the hardships, Cole says she wouldn't trade her experience as a Drill Instructor for anything. "It's a tremendous feeling of accomplishment when you graduate a platoon," said Cole. "You can't help but remember what they were like on that first day of boot camp." For more information on Drill Instructor Duty, contact your career planner. "There is nothing more challenging or satisfying than Drill Instructor Duty," said Cole.